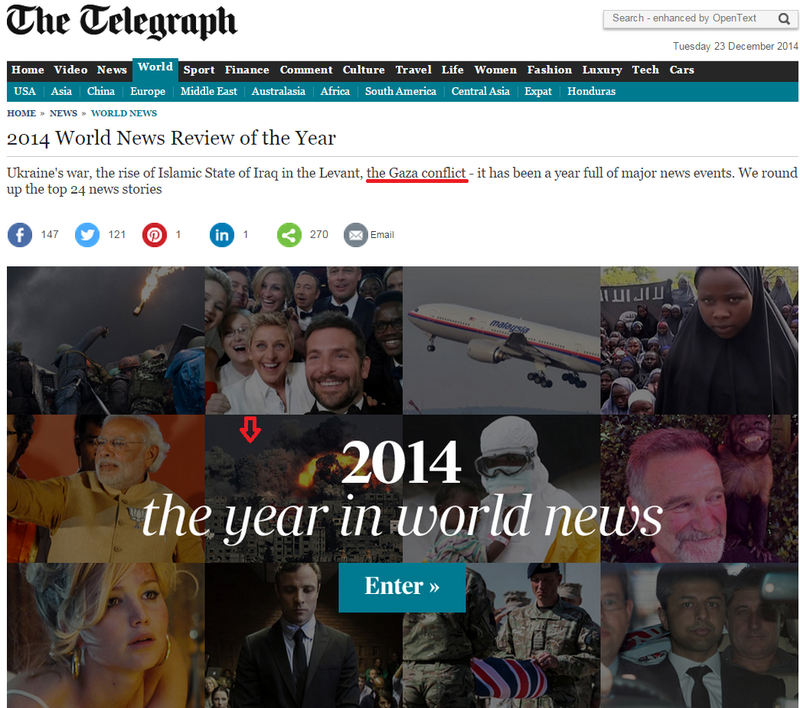 The Telegraph’s 2014 World News Review of the biggest stories in politics and culture included international news stories such as the disappearance of flight MH370, the crisis in Ukraine, the bloody march of ISIS jihadists and, of course, the war between Israel and Hamas. Interestingly, while there wasn’t a word devoted to the carnage in Syria (save a passing reference to ISIS control of parts of the war-torn country), out of 238 total words in the Telegraph’s introduction to their year-in-review page, 60 words (25% of the total) were devoted to Gaza. Here’s the paragraph on Gaza. Additionally, as you can see, Telegraph editors forgot to note that the teens (Naftali Frenkel and Gilad Shaar, both aged 16, and 19-year-old Eyal Yifrach) were murdered by terrorists shortly after their abduction. 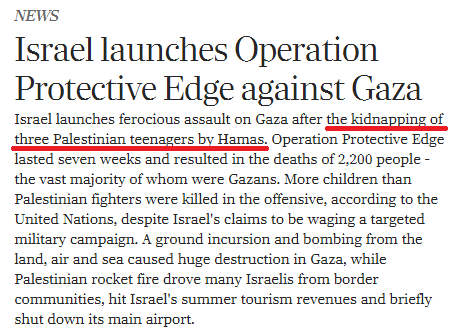 In addition to the fact that the section erases important context regarding the incessant rocket fire from Gaza in the days following the boys’ murder (rocket fire which motivated Israel’s government to eventually launch Operation Protective Edge), The Telegraph erroneously claims that the three abductees were actually Palestinian. Whilst conflating Palestinians with Israelis (in the passage cited above) likely represents an innocent error, we’re at a loss to explain how their top foreign editors could fail to note that three innocent Jewish teens were in fact murdered by Hamas terrorists in their paper’s intro to the lead-up to the summer war. UPDATE: Following our post, The Telegraph amended the passage with the erroneous reference to kidnapped “Palestinians”. The continued deterioration of the Telegraph. More and more looking like the Guardian. Professional journalists should adhere to the principles laid down by the SPJ Code of Ethics. Looks like the Left wing rags fall well below the minimum standards! Whereas the Elders of Zion are an overwhelming force, consisting of a deadly force of six millions, more or less, the Muslim and Arab minority of some negiligeable one milliard or so, with tiny oil reserves which have no impact at all on finances, currencies and trade, are a harrassed, discriminated people without land, therefore the murder of Jews is justified and doesn`t need to be mentioned especially. For the f… up antisemite Dinkle, that`s sarcasm.